The 2018 Luxury Lifestyle Awards category for Luxury Real Estate Agency in Phuket has been awarded to the team at Coldwell Banker Sea Property led by Norbert Witthinrich. The team at Coldwell Banker Sea Property, led by Norbert Witthinrich (far right) celebrates victory after taking home the win in the 2018 Luxury Lifestyle Awards category of Luxury Real Estate Agency in Phuket. 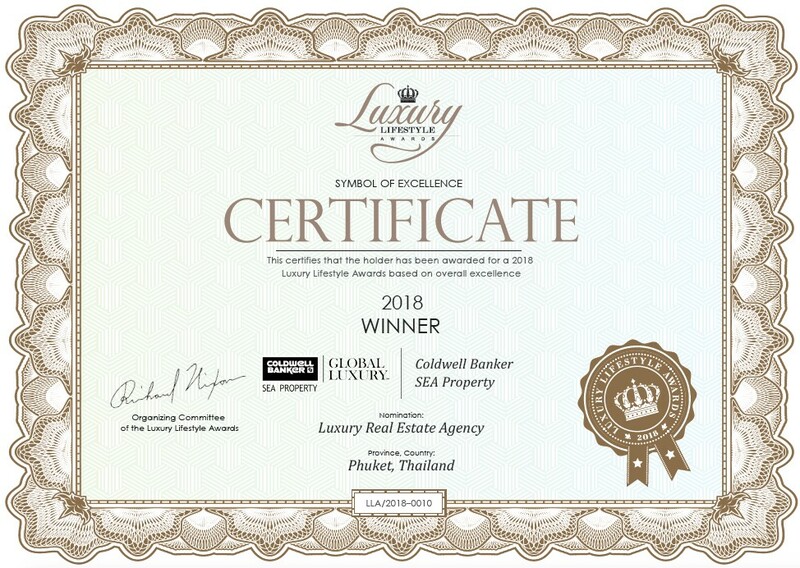 2018 Luxury Lifestyle Awards present Coldwell Banker Sea Property with the award for Luxury Real Estate Agency in Phuket. The Luxury Lifestyle Awards are an international awards organisation dedicated to the recognition of excellence among luxury goods and services. This year, the category of Luxury Real Estate Agency in Phuket was awarded to Coldwell Banker Sea Property, a luxury real estate agency led by Norbert Witthinrich. To achieve this milestone, Coldwell Bankers Phuket has been recognised for their work by a trusted board of judges via a thorough selection process. The jury panel comprises chief executives, top managers of leading luxury companies, business analysts and consultants, chief editors of international media and other reputable experts. All members are chosen for their global expert opinion and valuable practical experience. Offering a range of services, including luxury residential sales, short- and long-term rentals, investment advice, land sales, land banking and project management, Coldwell Banker Sea Property offers reliability and premium service for buyers and sellers in Phuket's luxury property market. The combination of excellent options, a highly professional team and global reach through the company's extensive international network are bound to create an unforgettable and completely satisfying experience for their customers. Coldwell Banker Sea Property "raises the bar" for luxury real estate standards worldwide. For more information about Coldwell Banker Sea Property or Phuket's real estate market, phone or email Norbert Witthinrich of Coldwell Banker Sea Property via the contact details listed below.